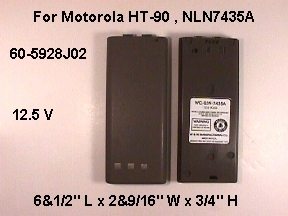 For Motorola HT90 , NLN7434A, NLN7435A, 60-5928J02, 60-5928J04. Ni-Cad battery, 12.5 V , 700 mah battery. Dimensions at 6&1/2" L x 2&9/16" W x 3/4" H. The battery is brought to you by Battery Barn. Your original charger will charge this battery.